Moscow’s three airports demonstrated disparate results in February 2018: whereas growth continued at Vnukovo and Sheremetyevo, traffic through Domodedovo further decreased. Domodedovo saw its traffic slide 2.6% year-on-year to 1.77 million passengers. The downward trend first manifested itself in the beginning of the year, when total passenger numbers dropped 1% compared to January 2017. International traffic shrank more significantly at 7.9% with 711,200 passengers served. Domestic traffic decreased 3.3% to 1.06 million passengers. Domodedovo reports, however, that flights to countries outside the CIS enjoyed an increase in the number of passengers in the first two months of the year. The most popular destinations included Dubai, Antalya, Doha, and Barcelona. Domestically, passengers preferred Penza, Novosibirsk, Kemerovo, Nizhny Novgorod, and Samara. Overall, the airport welcomed 3.84 million passengers in January and February. Vnukovo has been the fastest growing among the three airports. It served 1.2 million passengers in February, up 20.6% on the same month in 2017. The January growth rate was even higher, at 25.5%. The February boost in passenger numbers was mostly thanks to international flights, which saw 346,000 travelers or up 42.8% year-on-year. The most popular destinations from Vnukovo included Istanbul, Phuket, Milan, Baku, Goa, Dubai, Bangkok, and Dushanbe. Domestic traffic grew 13.6% to 870,000 passengers, with preferred destinations including St. Petersburg, Sochi, Krasnodar, Rostov, Makhachkala, and Mineralnye Vody. UTair Aviation remained the largest contributor to Vnukovo’s traffic; the airline carried 38.5% of the airport’s entire passenger numbers. Pobeda Airlines generated 28%, with its newly launched scheduled routes to Karlovy Vary and Saransk and charter operations to Venice contributing to the growth. Its sister carrier Rossiya Airlines transported 22% of Vnukovo’s passengers. Of all the international operators, Turkish Airlines demonstrated the highest growth rate in February at 27.5% year-on-year, the airport reports. Russia’s largest airport, Sheremetyevo, continued to enjoy steady traffic growth: the figure stood at 12.6% year-on-year in January and slid to 9.6% in February. 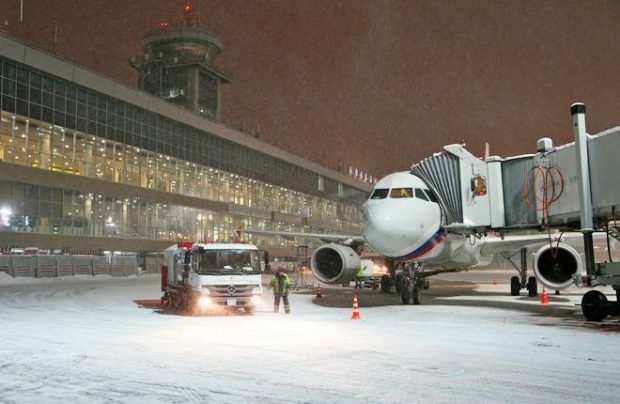 Sheremetyevo served 2.8 million passengers in February, including 1.3 million on domestic routes (up 12.1% year-on-year). The most popular domestic destinations were St. Petersburg, Sochi, Yekaterinburg, and Krasnodar. The international segment grew 7.5% to 1.5 million passengers, the most posular destinations being Prague, Bangkok, Tel Aviv, and Yerevan. Also in February, the airport saw the launching of an operation to Sharjah by LCC Air Arabia. Sheremetyevo’s cumulative results for the year’s first two months stood at 5.8 million passengers, up 11.2% on the same period in 2017. The largest contributors were Aeroflot, Nordwind Airlines, Air France, Royal Flight, and Air Astana. Russia’s fourth largest airport, St. Petersburg’s Pulkovo, served 953,900 passengers in February or up 6.35% year-on-year, as compared to 9.8% in January. The international segment grew faster at 18.7%, reaching 298,400 passengers. Minsk, Paris, Frankfurt, and Munich proved the most popular destinations. Domestic traffic remained almost level at 655,500 passengers, up just 1.4% year-on-year. The total number of passengers carried by Russian airlines in the first months of 2018 stood at 2 million passengers, up 6.3% on the same period last year. The trendsetters remained the same from the year before: Rossiya Airlines, Aeroflot, S7 Airlines, Pobeda Airlines, and Ural Airlines domestically, as well as Lufthansa, Belavia, Uzbekistan Airways, Emirates, and Air Astana.